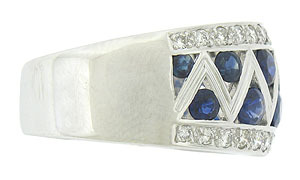 This breathtaking antique style wedding band features deep blue sapphires and sparkling diamonds. 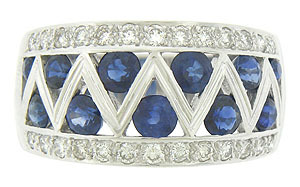 The round cut sapphires are held by bold zig zag cutwork, while the edges of the band are frosted in fine faceted diamonds. 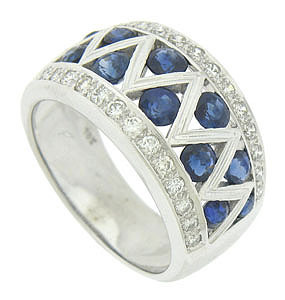 The wide band is brightly polished. 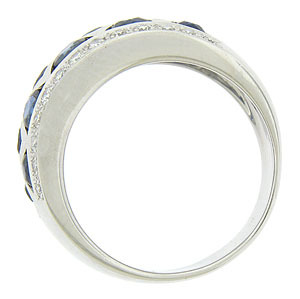 The wedding ring is fashioned of 18K white gold and measures 11.41 mm in width. Size 7 1/4. We can re-size.